Dr. Gamburg joined Delaware Valley OB/GYN from Princeton Windsor Obstetrics and Gynecology in West Windsor (Princeton Junction), NJ. A native of the USSR (Uzbekistan), Dr. Gamburg is fluent in Russian. He completed his undergraduate studies at the University of Louisville and attended medical school at the University of Kentucky. He then moved to New Jersey, where he completed a residency in Obstetrics and Gynecology at Jersey Shore Medical Center. After years on staff at the University Medical Center of Princeton he is now part of our practice. Dr. Gamburg is known for his kindness and gentle style and is one of several of our surgeons who perform DaVinci robotic surgery. 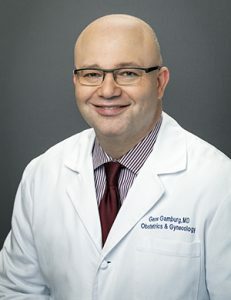 In his spare time, Dr. Gamburg enjoys time with his family and ballroom dancing.